Following up my blog article on Bombardier Aerospace on January 20th, where I dared to ask the question if it was time for Bombardier to look outside Bombardier and the family for a new CEO, like they did back in 2002, the answer came Feb 11th, when Mr. Alain Bellemare was hired as the new President and CEO and a member of the Board. This move was needed to give investors confidence things will change, as with the departure of Guy Hackey back in July of last year, CEO and President Pierre Beaudion has been running the show, and investors showed their displeasure by selling their shares, BBD.B has gone from $3.85 when Guy Hackey the President of Bombardier Aerospace was shown the door (like so many other before him), and since then the BBD.B shares have dropped by 34%, (based on 1.444 billion outstanding common shares class A and another 314 million class B shares outstanding), the market capitalization of Bombardier dropped by $C 2.32 billion since Guy Hackey’s departure, and with more debt and equity needed, the change at the top will be welcomed by many. This was a surprise, as few expected that both CEO Pierre Beaudoin and Chairman Laurent Beaudoin would be moving aside, to make room for a new CEO, it has been a pattern at Bombardier to move people up and up and then out. Investors have been worried about the company for some time, and the departure of the CEO will draw attention to the future and not the past when the stock has plummeted by 70% during the previous CEO’s tenure and numerous delays in undertaking 4 major new aircraft programs at once (Lear 85, CSeries, Global 7000 and 8000) have brought the company to a bad point in its history, where some prospects and customers are worried they may be a stuck with an ‘orphan’ after a few years (building a few hundred aircraft and then shutting it all down). The stock is down to $2.53 today, and a lot is expected of the new President and CEO Alain Bellemare, he is coming into a company in crisis, and he will have to steer it out of the crisis which few can do, unless they have good people around them, which is a big question mark. He is the first ‘outsider’ since Paul Tellier became Bombardier’s President & CEO in 2002, it lasted less than 2 years, and he was ousted in December 2004 after the stock dropped to $2.11, not much lower than it is today. Alain Bellemare was with UTC for 18 years left shortly after his close friend and another French Canadian, Chairman and CEO Louis Chenevert retired last year and who was also a close friend of Guy Hackey, small world, anyway Alain knows what he is in for. The CS100 (ABOVE photo), once estimated to cost $3.4 billion and now its $5.4 billion, this is the cause of a lot of problems at Bombardier today, it’s the biggest aircraft it has ever build and is aimed at a market segment (100-149 seats) that in most likely has greatly diminished in the past 7 years, firm orders are only 243 with 70% of the orders for the bigger CS300. The future of what Bombardier will look like in 3-5 years time, revolves around the success or failure of this program, period. Get it right and the future will be rosy for Aerospace and Transportation Divisions, get it wrong and the world’s only plane and train manufacturer may not be making planes anymore. Airbus took 69 weeks from 1st flight of the A350 to delivery to 1st customer, it has now been 73 weeks since the CS100 1st flight and only 900 hours of flight testing completed out of 2,400 (38% of the way), we are probably looking at another 52 weeks or so, then it will be 125 weeks at the very best. * Note: Since 2008 Bombardier has been talking about having at least 300 firm orders for the CSeries, a number that would and should be the break-even point with no discounting (Bombardier said it saw no reason to discount what it believed was an industry “game changer”), at that time the program was estimated at $3.4 billion. Now that the program cost is $5.4 billion (+59%), and surely the break-even point has moved by the same amount to 476 (+59%), but now Bombardier hopefully realizes the CSeries is not a “game changer”, the competitors aircraft offer similar cost advantages with new generation engines on existing airframes with some aerodynamic “tweeks”. Bombardier needs to start discount the CSeries to compete as both Boeing and Airbus are pricing their last production B737NG’s and A320ceo family aircraft significantly (+40% off) to keep the line going till the MAX and neo variants are ready to roll, so I would not be far off to expect break-even now around 550+ units, or 7 years of planned production at 100 a year, though it is looking like 60 to 75 at best is the realistic production rate, in that case break-even is many years out. 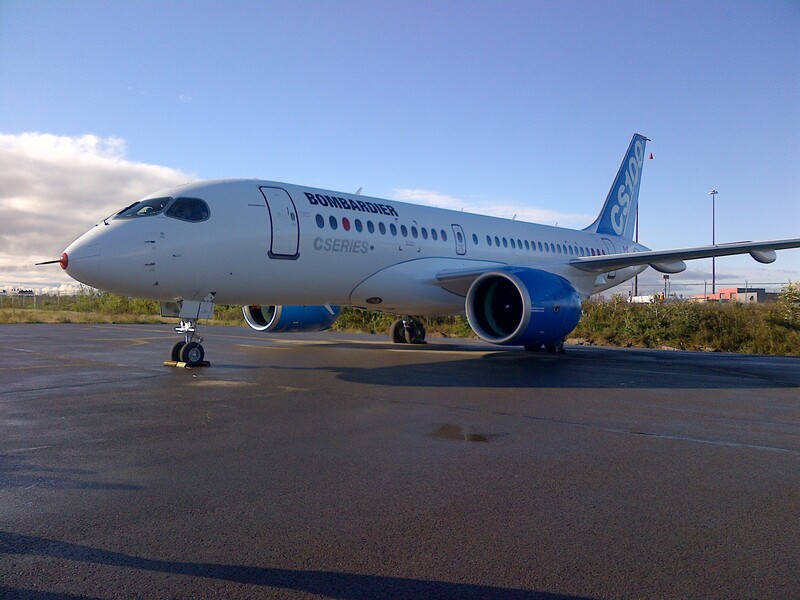 Bombardier could have beat Boeing and Airbus to the market with its CSeries, and be in a better place, but having lost its EIS advantage to Boeing and Airbus which were quicker in getting their re-engined B737Max and A320neo lines selling, its continued delays have reduced its competitive advantage against the Embraer E2-190/195 as well, and with fuel prices low and the trend to up-gauge aircraft and add more seats to existing aircraft, makes things a little bit harder as well, time to re-position the CSeries, no more “game changer” talk, get down to what makes it really competitive when everyone is now offering fuel efficient engines on their aircraft. Bombardier has announced that the CSeries program will now cost $US 5.4 billion, way over the initial estimate of $US 3.4 billion 7 years ago ! and $US 1 billion than estimated last year. The CSeries is draining the company, while firm sales are only 243 (63 x CS100 and 180 x CS300), so off course the company now needs to raise $US 2.1 billion in debt and equity to shore up its balance sheet as it continues working on the CSeries and Global 7000 for 2016 deliveries. Off course the stock price dropped on the news of more debt to a record low of $2.50 or 18% from an already low $3.05, only a year ago it was above $4.50 a share. Mr. Bellemare comes to Bombardier when the company is deep trouble with its aerospace arm, the CRJ and Q400 line are in their declining stages of the product life cycle, holding on with orders from existing customers, and thank god for the 76 seat scope clause in the US regional market, as it keeps CRJ-900’s orders coming, CSeries is struggling in sales and certification and now the business jet side is starting to show signs of trouble, with a book to build ratio of only 0.6 in 2014 even though it launched the Challenger 650 and 350 updates to the 605 and 300 and deliveries of Global 7000 and 8000 are hopefully 2-3 years away. The book to bill ratio is orders to deliveries, in 2014 orders were only 129 to 204 deliveries, the orders for 2014 have to be worrying, it is a 59% drop from 2013 orders of 305 aircraft. For 2015 Bombardier, Business Aircraft expects 210 deliveries, EBIT 7% and CFOA (cash flow from operating activities) $1.0 billion while it plans to spend $1.0 billion on the certification/development of the new Global 7000/8000 business jets, Commercial expects 80 deliveries, EBIT of 4%, CFOA neutral ($0) and 900 million on certification of the CSeries. So CFOA will be $1.0 billion and CAPEX $1.9 billion a $900 million short fall due to no CFOA from commercial aircraft, the CRJ and Q400 are ‘neutral’ programs, not adding anything to CF, just keeping workers busy till CSeries, EBIT of 4% is very low. The $52 million to $61 million Global 5000/6000 (ABOVE photo) program is the ‘CASH COW’ that keeps Bombardier Aerospace going, with business jets representing roughly 72% of Aerospace revenue, it is the business jet market that is driving the Division these days. With 80 Global 5000/6000’s delivered in 2014, that represents roughly $4.5 billion in sales just for this brand, put another way and Global brand is 43% of Bombardier Aerospace total revenue and 28% of aircraft deliveries (80 out of 290 in 2014), and with the high margins in the Global brand coupled to major discounting (+30%) on the CRJ and Q400 line, I suspect the Global brand is contributing a great deal more than the 43% in revenue to profitability, easily +60% by my estimate. This is the “cash cow” at Bombardier’s Aerospace Division, and this is why the $71 to $75 million Global 7000/8000 are so important to Bombardier, for the Global brand is now about to face lots of new aircraft competitors, mainly the new Gulfstream $65 million G650ER, $44 million G500 and the $55 million G600 with Dassault’s $53 million 7X and $58 million 8X right behind, looking to steal the market from Bombardier, and such competition will put margins under pressure, so all hope is on the Global 7000 and 8000 for the future. **Note: The importance of business jet sales for Bombardier Aerospace cannot at this juncture in time be overstated, it is why the o.6 order to bill ratio in 2014 must be worrying (that 0.6 sales for every 1.0 deliveries), business jet sales were off by 59% in 2014 (305 in 2013 to 129 in 2014). The Global brand is what is keeping the Aerospace Division alive today, any diminishing of that brands revenue and margins would be devastating for Bombardier, will have to ‘update’ the Global 5000 and 6000 to compete with the new Gulfstream and Dassault offerings and hope that the current global economic and political situation does not lessen demand at the high end, the market is 1,650 billionaires and the top 1,000 top global corporations, and they will be competing with Boeing’s BBJ (Boeing business jets) and Airbus’s ACJ (Airbus corporate jets) at this $70 million plus segment, a market is there but what is not know is how big it is, but we shall find out soon. Since 1996 Boeing has sold 228 BBJ’s and Airbus has sold 177 ACJ’s, that is 405 big VIP jets in 19 years, only 21 per year on average ! and many customers are Governments, but with Europe, Russia, China, Brazil all struggling economically, it will not be easy. Competition is heating up in the biz jet market which has been a solid market performer for years for Bombardier and the company cannot afford to see that market decreasing when it is spending billions more on the CSeries and the Global 7000/8000’s. Bombardier focus on the 650 and 350 while Dassault and Gulfstream are challenging the high margin business of the Global 5000 and 600 with their new Dassault 7X and soon the bigger 8X and Gulfstream launches the Gulfstream G500 and G600’s, is inexcusable, and with no reaction from Bombardier to protect and update its high end large jet offering, it will start to loose market share at a time when it can least afford it. The CSeries is way behind its certification schedule, with only 900 flight hours completed out of 2,400 flight hours needed, or only 38% of the way after 73 weeks today from its 1st flight on Sept 16, 2013. Meanwhile Airbus certified and delivered its A350-900 after only 69 weeks from its first flight. Based on the current 5 FTV’s (flight test vehicles) and a realistic utilization of 40 hours per month per FTV, it will take another 9.5 months, assuming no major delays, therefore at best end of November, 2015, but in this business there are always the unexpected problems (e.g. B787 and its battery problems). So, no certification of the CSeries till 1Q/2016. 1st delivery 2Q/2016 and therefore 2015 will have no revenue from the CSeries again, and it will be up to the Business Aircraft Division to keep Aerospace alive till EIS (entry into service) of the CS100 in 2016 and CS300 in late 2016 (at least 6 months after CS100). The numbers for 2014 came out and while there were some good news, like a revenue high of $20.1 billion for both Aerospace and Transportation (it is the world’s largest builder of planes and trains, and also the only one). Aerospace has revenues of $10.49 billion for 2014, with EBIT (earnings before interest and tax) of $437 million, a EBIT margin of 4.2%, but it took a $1.43 billion write down on the Learjet 85 program it “paused” which is a political way of saying it is cancelled, and EBIT was $ -995 million after the write down for the year. More worrying is the Free Cash Flow of a negative $1.059 billion, which is due to a $1.857 billion PPE (property, plant & equipment) tangible and intangible asset requirement, CAPEX ? from the $798 million cash flow from Aerospace. 1. 33 x Learjet 70/75’s, light jets, about $11 to $14 million each, with Learjet 85 “paused” this is all this Division has to offer $400 million a year in sales, what is the future ? discounting keeps it moving. 2. 54 x Challenger 300/350’s mid-sized jets, $24 to $25 million each, doing well, the Lear 85 would have competed with this line, one of the reasons it was “paused”. 3. 36 x Challenger 605’s mid-sized jets, $31 to $32 million each, the old Challenger goes back to the 1980’s, constant improvements keep it going, for now. 4. 80 x Global 5000/6000’s large, long range jets, $52 to $61 million each, this is the bread and butter the “cash cow” of the Bombardier Business Aircraft Division, now under attack from Gulfstream and Dassault, this is a high margin business, this has to work for Bombardier, as it has gambled on the even bigger and longer range $75 million Global 7000 and the $71 million 8000, remember 72% of Aerospace revenue comes from Business jets, and around 60% of that ($4.5 billion) comes from Global sales today ! 5. 1 x Learjet 60XR, mid-sized jet, $12.6 million, last one delivered, end of the line. 6. 59 x CRJ’s, a 76 seat regional airliner, price around $47 million, though discounting by Bombardier (+30%) is big these days. 7. 25 x Q400’s, a 78 seat fast regional turboprop, prices around $35 million, heavy discounting keeps it ‘competitive’ though ATR-72-600 is taking most of the sales today. 8. 2 x CL-415’s, a specialized water bomber or maritime patrol aircraft, priced at $31 million, limited specialized market. So what Allan Bellemare needs to do is fix the corporate culture, I still read many emails from Bombardier employees about over-engineering, hiring non-aviation minorities, Quebecois nepotism, bullying, internal chaos all want see drastic management and work cultural changes. Business jet sales need to pick up in a big way, because there will be NO revenue from the CSeries in 2015 again, just CAPEX (Capital expenditures) and investments to complete certification, begin production and deliveries, for 2015 it is expected that CAPEX will be $1.9 billion on the Global and CSeries certification work. The CSeries is NOT the “game changer” they thought, let’s be real, it does offer operating cost advantages, but 90% of that comes from the PW1500G engines, which in various sizes, Embraer, Airbus and Mitsubishi are using as well, so forget the BS and sell it on its value proposition, especially the CS300 with more seats has a bigger chance of success, airlines want seats, the more the better lately. Almost ALL airlines today are up-gauging their aircraft and increasing seat density inside the aircraft. All 4 major US carriers are increasing seating density with slimmer seats and less pitch, AA is adding 10 seats to its B737-800.s JetBlue the doing the same to its A320’s while upgauging is happening everywhere you look with A321 joining many airlines like Spirit, American, Frontier, etc. and UA and DL are adding B737-800ER’s to their fleet, its all about CASM (cost per ASM). Bombardier needs to penetrate more countries, it was too reliant on the North American market for CRJ sales, while Embraer EJets are on all continents, and in much more countries. It needs to bag a US customer, it won’t be Republic, forget the 40 aircraft order for CS300’s because the scope clause will NOT change for some time. Business Aircraft, 210 deliveries, EBIT (earning before interest and tax) 7.0%, CFOA (cash flow from operating activities) $1.0 billion, CAPEX (Capital expenditure) $1.0 billion (Global 7000/8000 certification). Commercial Aircraft, 80 deliveries, EBIT 4.0%, CFOA neutral $0+/-, CAPEX $ 0.9 billion (CSeries certification). So what is next for Bombardier ? well, sell non core businesses, which has started with the $19.8 million sale of its military training unit to CAE Inc., that is a start, but now it needs to get out of anything that is not a core business. Maybe sell the DHC-8-100/200/300 line, there is good use for it still as ATR-s 140 orders in 2014 showed, and they did it with their DHC-6 Twin Otter, DHC-Buffalo, DHC-2 Beaver and DHC-3 Otter they went to Viking Air, which has restarted the DHC-6-400 Twin Otter line, and may start the DHC-2Turbo Beaver line. India needs a DHC-8 type aircraft, why not sell it to them ? The Business Aircraft are the future of the company, so along with the new Global 7000 and 8000, Bombardier needs to update the Global 5000 and 6000 to face the G600 and G500, but that update needs to be a whole more than the Challenger update that is rather trivial to a customer. It has “updated” the Challenger line with the $25.9 million 350 replacing the 300, for $1 m extra you get bigger window, more power from the engines, updated Pro Line 21 avionics s and 145 nm more range, which is really not much of a change for a customer, and then the $32.35 million 650 replaced the 605, only $500,000 more you get 5% more power, new cabin management system and better flight deck, these are all small changes that to me are not enough. Lastly, Commercial Aircraft needs to change its position in the market, the CSeries is not the “game changer’ they thought it was, they are stuck with it, but it will not be a major success and the Q400 and CRJ are at the end of their product life cycle, so tie up with COMAC of China, they are already cooperating on CSeries and C919 commonality, and the Chinese need Bombardier expertise in customer support, engineering and reputation if they are going to make the C919 a success outside of China. I wish Mr. Allan Bellemere much success, he has a big job and not sure if he has the people to make change happen, the problems are deep rooted, and after many layoffs, moral is low, even investor and customer confidence is low, customers are bewildered by events and customers worry about the lack of relationships with Bombardier, while new financing will show that debtors and investors will want higher returns for the risk associated with Bombardier today. I will keep you posted, thanks again for your interest. « ABSTRACT: Canada Jetline and Jet Naked are racing to be Canada’s first ULCC (ultra low cost carrier), both looking to start this summer but funding the initial $50 million start up costs is dragging on, yet Canada Jetline orders 5 x B737-Max7’s and purchase rights on 16 more but delivery is not till 2021 and start up will be with old B737-300’s, can one of them do the same that Westjet Airlines did 19 years ago when it WAS a low fare airline with 3 x B737-200’s ? and when Air Canada failed to crush it early on with its failed LCC ZIP, presently Air Canada is busy with its low cost but not low fare subsidiary Rouge, while Westjet is building up its regional network with Encore and its wide-body fleet with B767-300’s (???) for flights to Europe and Hawaii, current distractions at AC and WJ are good for the ULCC hopefuls, Canada needs a LCC as we live in the ONLY major country in the world without a locally based LCC we can turn to for low fares as the duopoly here (AC and WJ have yields of +/- 19 cents/RPM) and have NO incentive to lower theirs, it is why +4.9 million Canadians drive to US border airports to fly on US carriers every year !